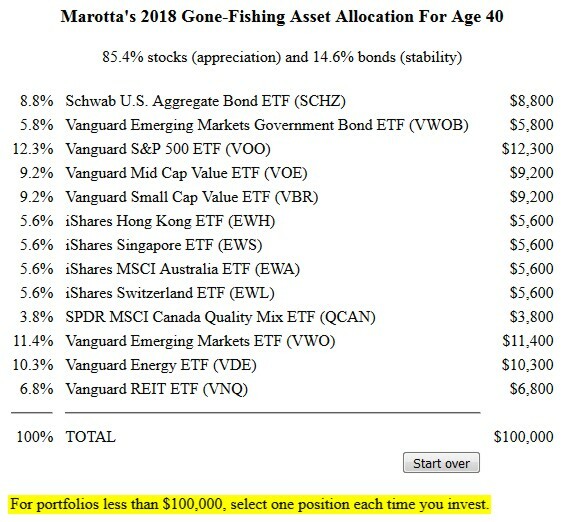 On the primary Marotta 2018 Gone-Fishing Portfolio, for portfolios less than $100,000, it increases the investment to $100,000 and recommends that we select one position each time you invest. What position should I invest in first? Three of our gone-fishing portfolios are crafted to use investments that have no transaction fees at a given custodian: Vanguard, TD Ameritrade, and Schwab. As a result, I made sure they allow for any dollar amount this year. Our primary gone-fishing portfolio includes investments which may have a trading fee in order to invest at the custodian. That trading fee might be as low as $4.95, but you would not want to invest $50 and pay 10% in trading costs. That raises the question, how much of an investment is worth paying a trading fee? At $4.95 per trade, an investment of $500 would pay 1.00% in transaction costs. And an investment of $5,000 would pay only 0.10% in transaction costs. We believe that keeping costs low is more important than having a diversified portfolio with your first $5,000 investment. Consequently we set the minimum total investment amount for our primary non-transaction fee gone-fishing portfolio at $100,000 in order that the smaller positions be closer to $5,000 purchases. 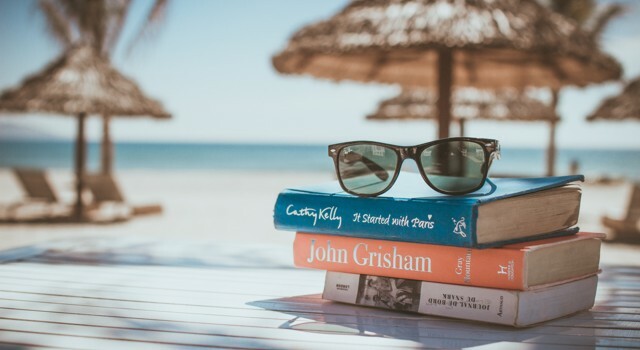 Assuming that you are funding your Roth IRA each year for $5,500, you can start by investing in the most volatile investments first and less volatile investments and bonds last. This gives the most volatile investments the longest time to grow or recover. You can also alternate between asset classes of US stocks, Foreign Stocks and Resource Stocks. If your ultimate investment for a $100,000 portfolio should be larger than $5,500, just invest $5,500 and move on to another category next year. Circle back to the category after investing something in each category. In this way you will gradually be building the asset allocation for your future $100,000 portfolio. Emerging Markets for example Vanguard Emerging Markets ETF (VWO). In ordering the investments, I have separated similar investments such as Hong Knog and Singapore which both contain a large percentage of financials. I have also broken up Australia, Canada, and Energy investments because those two countries contain a large percentage of energy. And for large positions there are two opportunities to invest to approximate this asset allocation. If both you and a spouse are investing $5,500 each year, one spouse can invest the even numbers and the other spouse can invest the odd numbers. By the time you have finished investing this list at $5,500 each, you will have invested $93,500 and probably have a portfolio well over $100,000.